Recently B connected two saliently fortuitous details. 1) Our cocktail bookshelf has at least two volumes dedicated to gin, and 2) we have a copious examples of gins in our cabinet. Seemed like a prime opportunity for a couple of academics to make a scholarly study of the subject. And realizing the importance of peer review in all scholarly endeavors, we decided to bring in long-time friend, scholar and fellow boozehound, Briana, as well. A careful review of Aaron Knoll‘s Gin: The Art and Craft of the Artisan Revival provided a detailed framework for exactly how to taste gin, including a notepad and pen. Gin is curious in that it is the only liquor that typically is not consumed straight; unless your idea of a martini is whispering the word “vermouth” with your back to the cocktail glass, then you are drinking straight gin. 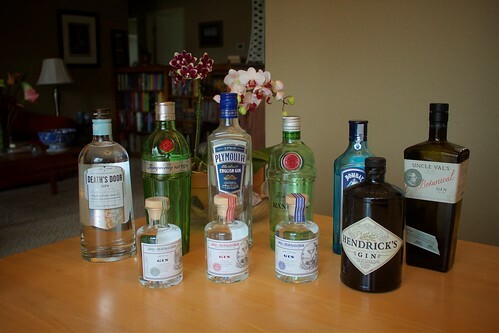 The first thing that immediately surprised us was how different all of the gins were (even some mainstream ones). 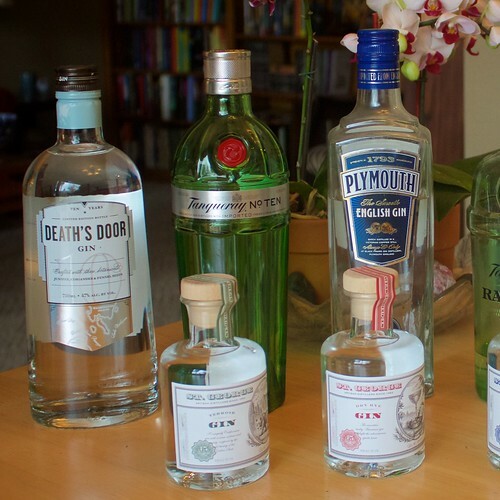 We decided the Plymouth London Dry was the reference for the gins. Our house gin, Beefeater gin was very similar and universally liked. This is another venerable classic London dry gin. When you are trying to make a classic cocktail, you pretty much want a classic style of gin. It also has a more favorable price point compared with a number of the other gins we tried here. We all also really liked Tanqueray’s No. Ten offering. It was a little lighter and slightly less juniper forward than the Plymouth. Tanqueray’s Rangpur, however, was more of a mixed decision. It is very light on the juniper and much heavier on the citrus. Briana really liked this one; B not so much. Interestingly none of us really cared for the the Bombay Sapphire East gin, despite all liking the regular Bombay gin and their Sapphire label as well. The East version starts with the botanicals of Sapphire, but then adds a fair amount of lemon grass and black pepper. I would likely make for a good Bloody Mary (so would regular Bombay with a couple of grinds of black pepper), but we didn’t think it would pair well with most gin drinks. St. George Spirits, our local distiller, also makes three gins, Terroir, Botanivore and Dry Rye that have been well received. We all liked their classic Terroir gin. Briana and I also found their Bontanivore, with a very different (Seville oranges, coriander and star anise) enjoyably interesting. None of us cared for their Dry Rye, which tasted like a weakly aged whiskey. They claimed it would be good in an Old Fashioned, unfortunately actual rye whiskey would be even better. Finally, we all really liked Wisconsin’s entry, Death’s Door, which was a fairly juniper forward but nicely balanced with other herbal notes. Again what was really interesting was how distinctive each gin was from the others, far more than for other styles of liquors that I have tasted in the past. And while I would recommend going with gin neat on a regular basis, it made for a particularly interesting exercise. Ultimately Briana and I had gin and tonics made with the Tanqueray Rangpur and some Fever Tree tonic. The heavy citrus qualities played well with the tonic. B had a Negroni with the Tanqueray No. Ten. I see Hendricks but read nothing about it in your review. Personally I find it to be at a different quantum level from all other gins I have tried, and feel it is one of the few that can be consumed neat. Over the rocks I find it superb. Agreed. I should have probably should have mentioned it. Details were a bit hazy after the tasting. Also pencil and paper were missing. Hendricks is subtle. It’s definitely still in the London Dry style, but there is something there that makes it more complex/less harsh than other examples. My problem is every time I think about drinking gin straight, is that there is bourbon and tequila so I always seem to go there instead.